Gilles Massot is a multidisciplinary artist whose current project The Probability of Veracity is focused on Jules Itier (1802-77), a French customs officer who made daguerreotypes of his journey around Asia in 1844-45. In part one of this project, Massot used painting to re-create the seven missing daguerreotypes mentioned in Itier’s published journal. 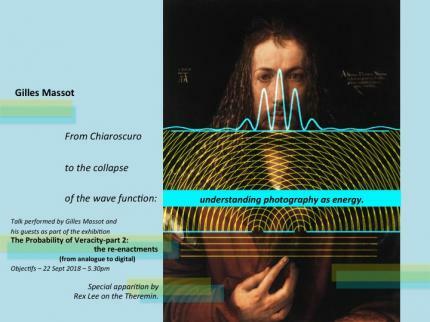 In this exhibition, which presents the second part of the project, Massot uses a highly experimental technique to reflect on the development of photography since Itier’s original works were first created in the 19th century. Massot travelled to the six Asian cities where it is known that Itier made at least one daguerreotype: Singapore, Manila, Macau, Canton (Guangzhou), Danang and Galle. Massot first shot re-enactments of the original images with a pinhole camera on 120mm film. He then scanned the negatives and printed the images on silver paper with a video projector. Employing techniques from analogue pinholes to digital light, the final prints thus encompass the full technical history of the medium of photography from its birth to today. This photographic installation with design contribution by Laura Miotto is also complemented by a soundscape by musicians Rex Lee, Leslie Tan and Luke Chen, whom Massot invited to collaborate with him. The soundscape blends romantic cello music contemporary to Itier’s times, and found sounds extracted from the video documentation of Massot’s image-making process at the six locations.